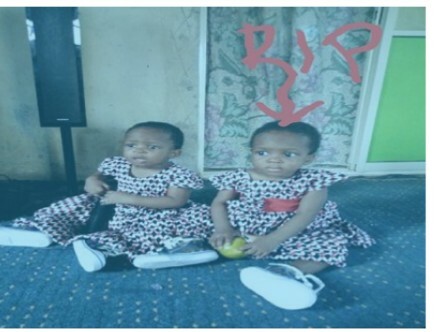 A distraught father, Adeola Adetunji, has cried out for justice after his 15-month-old twin daughter, Taye, died at a private clinic owned by a paediatrician with the General Hospital in Igando, Lagos, identified simply as Dr. Joy. The man said he was angry because he had asked his wife, Taiwo, to take the child to the General Hospital on Sunday evening after she informed him that she was running temperature. But rather than attend to the child, the paediatrician, Adetunji alleged, lured his wife to her private hospital in Egbeda (HJ Clairoowen Medical Centre and Maternity), where blood was administered on his daughter without screening, in an unkempt environment and with no supervision. It was gathered that it is a trend at most general hospitals for doctors to woo desperate patients or their families to their clinics under the guise of providing better care, only to exploit them. Narrating what transpired, the child’s mother, Taiwo, said that she arrived Igando General Hospital around 6pm on Sunday and Dr. Joy touched the baby’s eye and told her she needed blood and oxygen. “She said the baby needed blood and oxygen, that there was no bed space and that she would refer the baby to another hospital. She called someone there and said the blood would be ready before we got there. She collected blood from the baby and she said there was no need to collect blood again to make it fast. “She did not tell me initially that it was her clinic. It was the first time I would be at Igando General Hospital. We got there around past 8pm and immediately, they put the blood on my baby, she reacted and bit me. “I tried to remove the thing from her hand, but the doctor (Badmus) said I should not take it off that I should hold my baby’s hand very well. When I noticed she was reacting, I called the doctor’s attention, but they said it was normal that the blood was circulating in her system. “Suddenly, I noticed she was breathing slowly and she gave up the ghost in the process. They killed my daughter, that is all I know. It was only temperature my baby was running, but my husband insisted I should take her to the General Hospital, Igando because they have specialists there. “I was not charged any fee at the General Hospital, but she said the blood is N20,000. They collected N29,000 at her hospital and card fee N2,000. We got there around 8pm. It is a lie that my baby was shaking when we got to her hospital. It was the blood she reacted to and started shaking and then died,” said the woman. It was not just a mistake, it was a costly mistake which arose from their selfishness and greed. Meanwhile,Dr joy when confronted,has admitted that she erred by referring an emergency case from the General Hospital with all facilities to handle it to her clinic with no standard equipment. Health Commissioner Dr. Jide Idris has ordered investigation into the circumstances that led to the death of the child, as well as allegations of patients poaching by doctors from government hospitals to their private clinics. Checks with the police confirmed that the family had lodged a complaint and the doctor invited for questioning by the Igando Division. Government hospital is a SHAM!!! All doctors that are under governmnet payroll are always in a haste to leave the hospital premises and move to other private clinics. Stella, i just lost another baby due to incompetent cervix only because i was asked to go run a TVS inorder to check for my cervix length. Before i got back, the doctor assigned to me had left! Stella, our health system is deadly!!! I know by God's grace, if it were not Nigeria, with my history, i would have had that baby successfully. After the loss, i wanted to try parklande but was told doctor Orebanjo isn't in the country at the moment so opted for premiere......Chai, the bill is crazily out of this world!!!!! 450k deposit for vaginal delivery and 850k deposit for CS!!! Please remember me in ur prayers cos 10years in my marriage without a child cant be comprehended. U ll carry your next pregnancy till full term and deliver safety in Jesus name, Amen. Your very right and please say the Hail Mary . Catholic or not. It's not news that most doctors under the payroll of the government also engage in private practice. That in itself is not a biggie but the fact that some do it strictly for money, not minding the well-being of the patients is really sad. How much is a human life worth in Nigeria? Na Buhari cause this one again? We are enemies to our own sef. selfish and very greedy. We Nigerians! Is her so-called Clinic Licensced?? Her License needs to be Revoked! She needs to spend time behind bars. At least 10-15 years, this would not bring back the death of the innocent child, but it would serve as a detriment to other Doctors who selfishly meas with the life of innocent patients. If not for greediness and selfishness, this costly mistake would have been averted. God will console the family and the soul of this little one rest with the Lord. Sad!, na their way be dat o, even to do test, they will say cone back or refer you to their private labs . Greedy lots.